The passing of Newfoundland- based artist and educator Colette Urban on June 16, 2013, at the age of 61, still resonates among artists, curators and gallery- goers. Fortunately for those who knew her – and perhaps especially for those who never had a chance to – her work continues to circulate, inform, inspire and, apropos of her latest exhibition at the SAG, to puzzle. 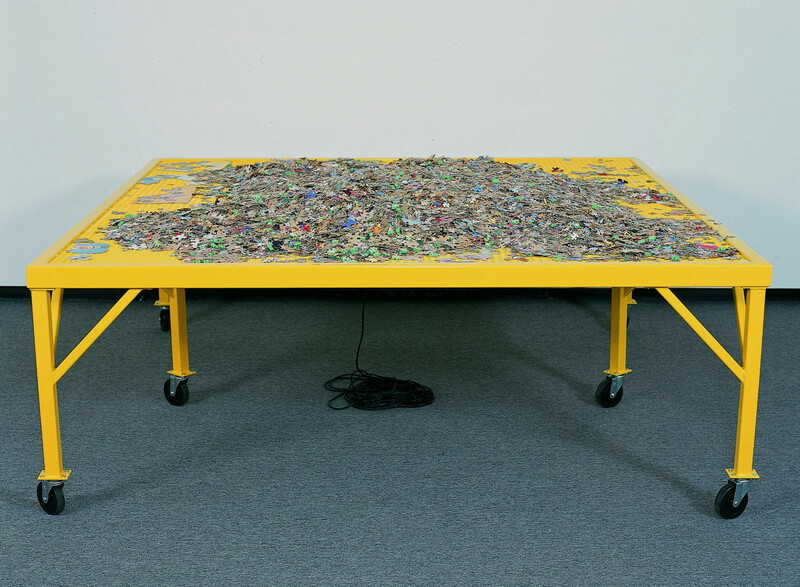 At first glance Gambler (1986) is a relatively simple-looking sculpture comprised of an industrial work table on top of which are thousands of jigsaw puzzle pieces. Accompanying the sculpture is an audio recording of a bingo parlour, with a voice calling out letters and numbers followed by a range of responses: sometimes silence, sometimes laughter, sometimes the word “Bingo!” followed by its own response – a chorus of groans. As this is an interactive work, the installation is only the beginning. Patrons are encouraged to stand over the table and note which pieces are joined together, either to add to them or to take them apart, or perhaps to reach into its unassembled mound and feel the weight, the texture. Like bingo, jigsaw puzzles have a defined and uniform outcome. Unlike bingo and jigsaw puzzles, art does not. Gambler resulted from Urban’s interest in the transformation of Vancouver’s False Creek lands from a site of heavy, resource-based industry to that fairground known as Expo 86, which, like the “Bingo!” shout, elicited its own response: the eventual remediation of those lands for its own defined and uniform outcome – high-end market housing. If Urban were alive today, I am sure she would know what to make of it.